Account opening on OctaFX is a fast and easy process which is done in a few simple steps. We help you to set up a real or demo account and lead you through the first steps of trading forex. We also cover other factors that you should be aware of before trading. Please notice that by opening account you confirm that customer agreement has been read and you unconditionally agree with its provisions. Forex margin trading involves substantial risks. Before entering forex market you need to be aware of risks involved. AML and KYC policies. In order to protect accounts of any unauthorized access and to secure transactions we require documents verification. In order to start the registration press the Open account at the top right corner of the Menu (Step 1 image). You can start the registration at OctaFX from Any page. If the registration at the Menu looks complex, you can always start your registration from a signup page. In the pop-up window you need to write your full name, email address and create a password. According to our KYC policy you can only provide us with real data. Then, please, check your mailbox and complete registration process by verifying your email address. 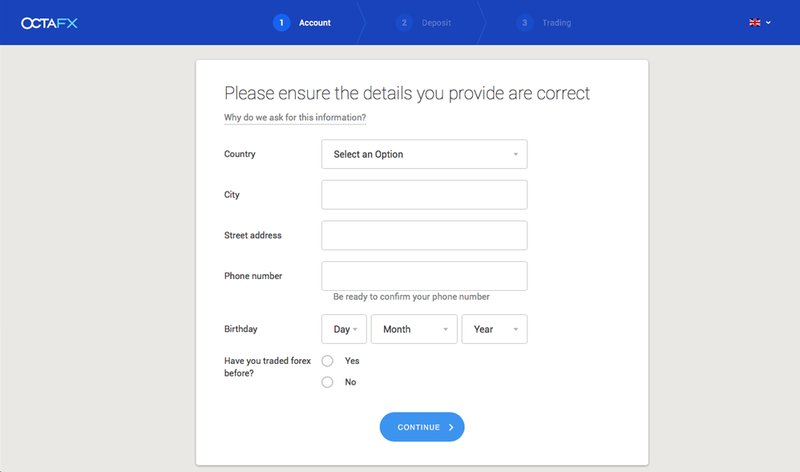 After you followed a verification link in your email you need to fill in your personal details, such as country, city, address, phone number, date of birth. The information provided must be accurate, relevant, up-to-date and should be a subject to KYC procedures and verification. Please notice that you need to be of a legal age to trade Forex. At the next step you need to choose trading platform and type of your account. We have two types of accounts: real and demo. You can open a free demo account to practice with virtual funds without any risks. Demo account is made to show clients how real platform looks like and operates. It is also created to train your skills, test strategies and test bots and trading scripts. Please, notice, that you cannot withdraw profit from demo account or transfer funds to the real one, because funds are virtual. Micro account to trade on MetaTrader 4. The best choice for novice traders as it is user friendly and has hundreds of built-in indicators. Pro account on MetaTrader 5. The platform is considered to be the future of retail trading. It has more features, time frames and trading assets. ECN account on cTrader. Highly customizable and modern platform which meets all needs of traders of all levels. 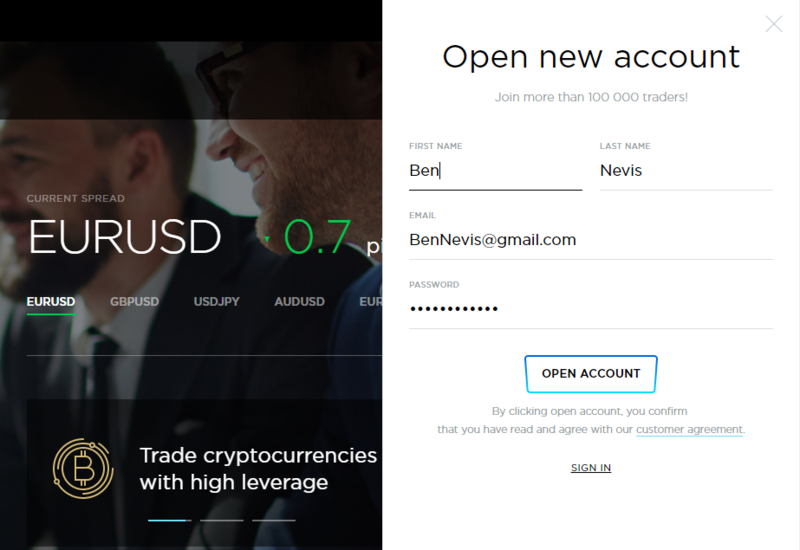 After choosing a platform you need to click ‘Continue’ and your trading account will be created. Then you can go ahead and make your first deposit or you can firstly complete verification process. Please, notice, that according to our AML and KYC policies our clients must verify their accounts by providing required documents. We request only one document from our Indonesian clients. You need to take a photo of your KTP or SIM and submit it. This way validates you are a sole holder of trading account and insure prevention of any unauthorized access. 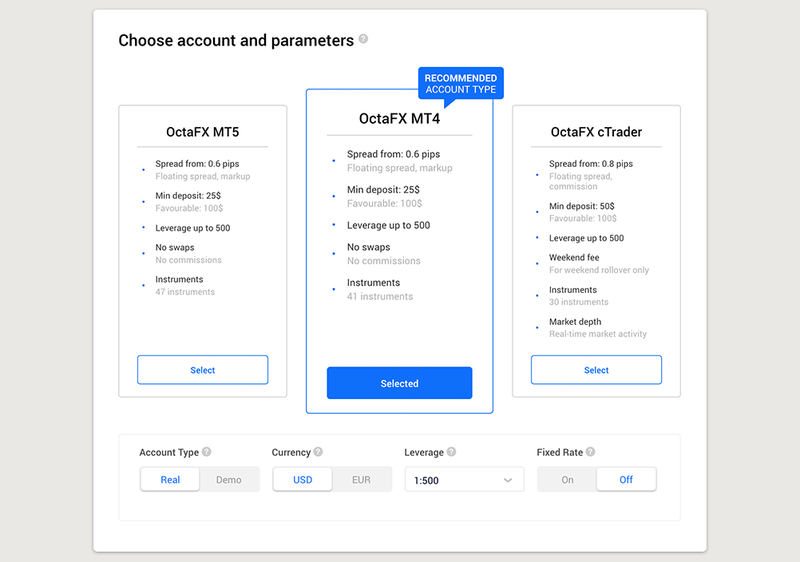 Following the steps above allows you to create trading account on OctaFX. In order to start trading you need to complete the deposit process. Read “How to make a deposit at OctaFX”.